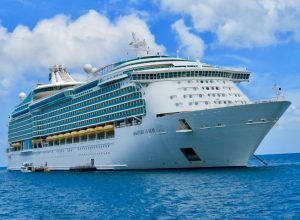 The magnificent Mariner Of The Seas was our stunning home for 28 days travelling from Singapore to Barcelona. It’s not difficult to meet fellow gay cruisers once on board a Royal Caribbean cruise. From our point of view our cruise offered us a hassle free holiday. We unpacked once during the whole voyage, woke up in exotic foreign ports not having moved from our bed, rested and ready to explore and sample the culture, history and local scene of some countries that would not normally attract gay travellers. 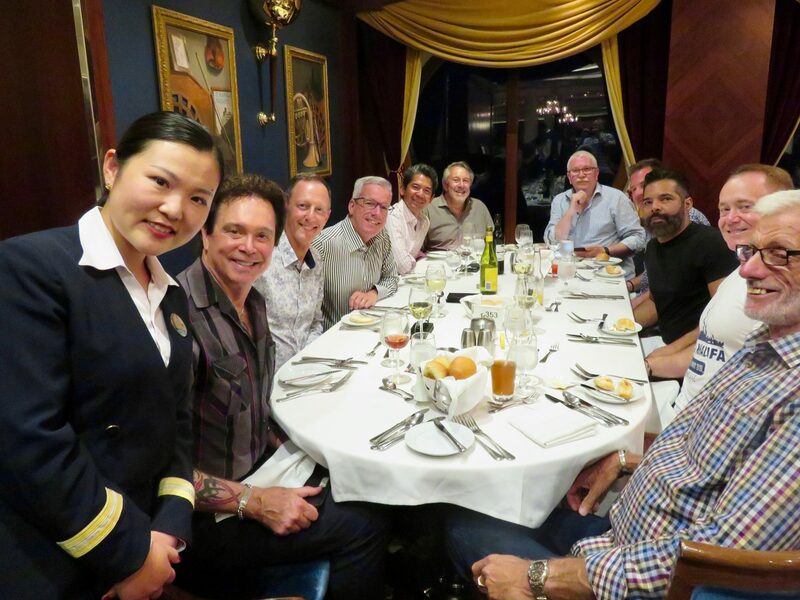 This cruise gave us ample time to relax, to see amazing, alluring places and to meet gay travellers from a wide variety of places around the world. 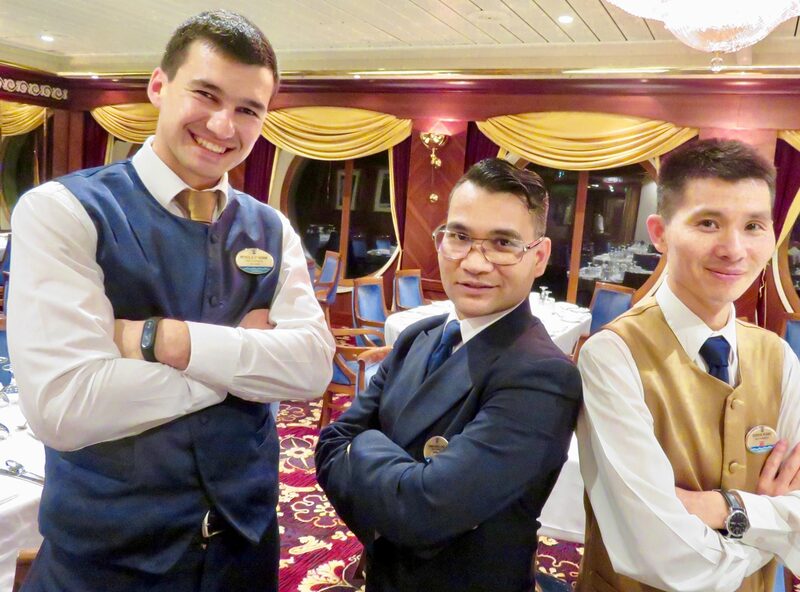 Friendly, helpful staff members helped us feel right at home on our cruise. As there were a large number of sea days between ports of call on our cruise we had time to laze in the warm sun on the top deck with 360 degree views of endless deep blue ocean and use the ship’s abundant facilities like the gym, sauna, thermal whirlpools and shopping esplanades. 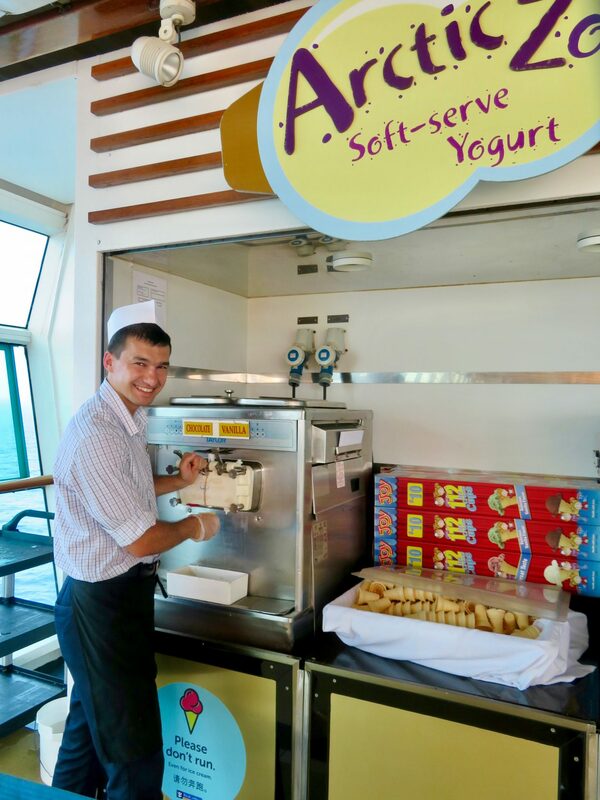 The entertainment options on board kept everyone engaged throughout the days and evenings. We also learnt a few new words at a Mandarin class, enjoyed spectacular shows every evening in the Savoy Theatre and, of course, there were the all important food options which were lurking enticingly around every corner. Oh, if you like a drink, purchase a drinks package. Although it might seem a little expensive you will not be watching every drink you buy and if you like a few, it’s actually very good value. 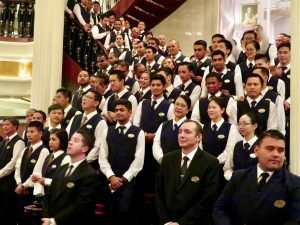 Even the dining room attendants sang for us during our supper and they were superb. It was only the second day when we met some other gay guests. The LGBTQ meetup advertised by Royal Caribbean in their daily ‘Compass’ brochure made that quite easy. However, as we wandered around the decks and through the dining room and Windjammer buffet we easily met other ‘like minded’ mariners. Sea days are time to chill out. Did we experience any problems as gay travellers, either from other guests or staff? Absolutely not! As Grant Van Ulbrich, Royal Caribbean’s Director of Diversity and Inclusion says, the company does not accept discrimination in any way, shape or form. Our new friend Amy Li kept in touch with our group to make sure we were well looked after. 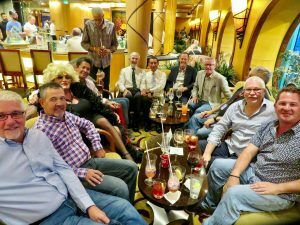 Here are just a few comments from gay cruisers we met on our voyage from Singapore to Barcelona. 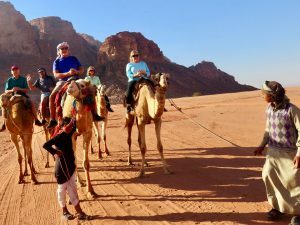 Some of our new friends on board gave us reasons why they choose to cruise instead of other forms of travel. 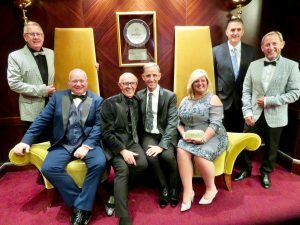 Jack is a highly experienced gay cruiser who belongs to the Royal Caribbean privilege group of travellers called the ‘Pinnacle Class’. Jack loves cruising and from his point of view, as a solo cruiser, he believes it is the only way to travel. Our final night LGBTQI get together. He always makes sure he takes advantage of attending the first LGBTQ meetup but looks up the ship’s Facebook page well before the cruise starts, to meet other gay guests online and plan meet ups for drinks, dinner and shore excursions. On this cruise Jack prearranged a meet up with four other gay guys at Boleros Bar on the first night to get the good times rolling right from the start. We experienced incredible destinations and shore excursions. Lee is an experienced traveller who has cruised often. We were curious why he chose to travel from Singapore to Dubai, with quite a few stops in India and the Middle East. ‘Easy!’ he said, “Some of the ports of call can be pretty unwelcoming destinations for gay travellers but I still want to see them, even if it’s only for a day”. 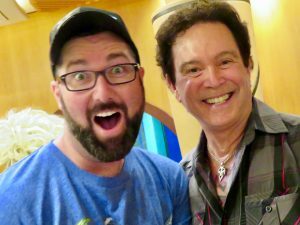 Look who GayMenOnHoliday.com met on board Mariner of the Seas. He feels comfortable being part of a group on a shore tour. At the end of the day he can return to the ship knowing he doesn’t have to scour some unknown city at night, where dangers may be awaiting unsuspecting solo gay travellers. Fun and frivolity with Adult Quest, Blankety Blanks and Love and Marriage game shows. 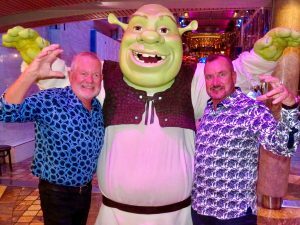 Gay couple Dan and Richard also love to cruise because they see it as an opportunity to “dip their toes in” to a whole lot of different destinations with hassle free customs and immigration and the easy availability of shore excursions. 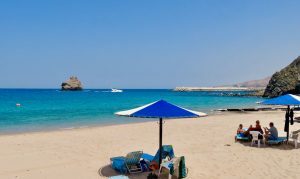 They also mentioned that if they really liked a place then later they might return as independent travellers to spend longer exploring all it has to offer. But on this trip, cruising gives them just a taste of cultures they haven’t yet experienced. This pristine beach in Muscat was quite unexpected. 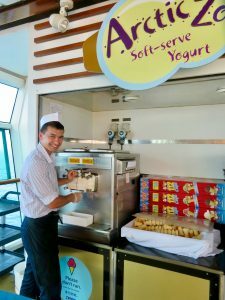 On this cruise our destinations were fascinating and exotic. “The more sea days the better. It gives me time to chill out”. 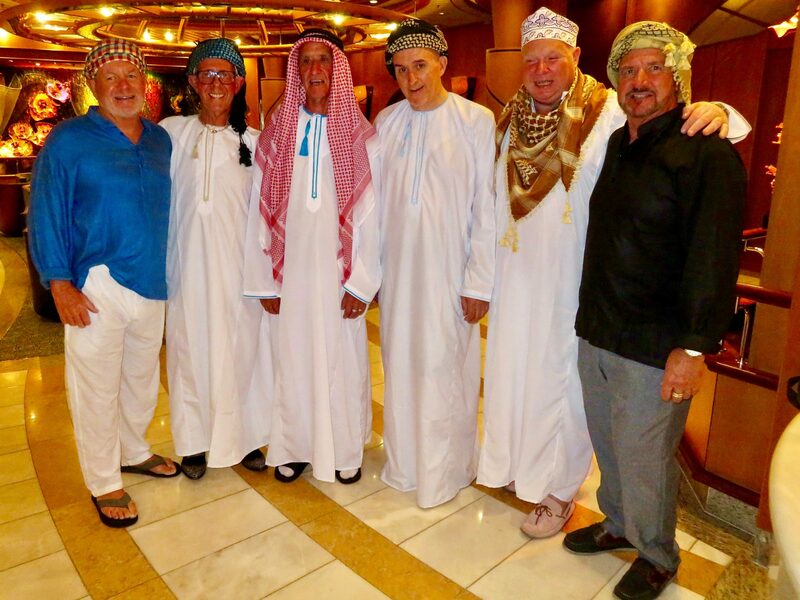 It’s dress up time for a Middle Eastern theme party. It also gave him an opportunity to sample some of the large number of activities on board from duty free shopping, wellness seminars, lectures, poolside games, the ever popular trivia, rock wall climbing and sushi classes. He said he was definitely spoilt for choice. The International Ice Cast performed Ice Under the Big Top, an additional show which wowed cruise guests. Raf and Will from Arizona treat their cruises as “me time” using the Spa, sauna and gym. But best of all Raf loves the fact that food is everywhere, being someone who spends a large part of the day exercising to keep his magnificently muscled physique. “As soon as I wake up I know that good food choices are available and that makes me very happy”. 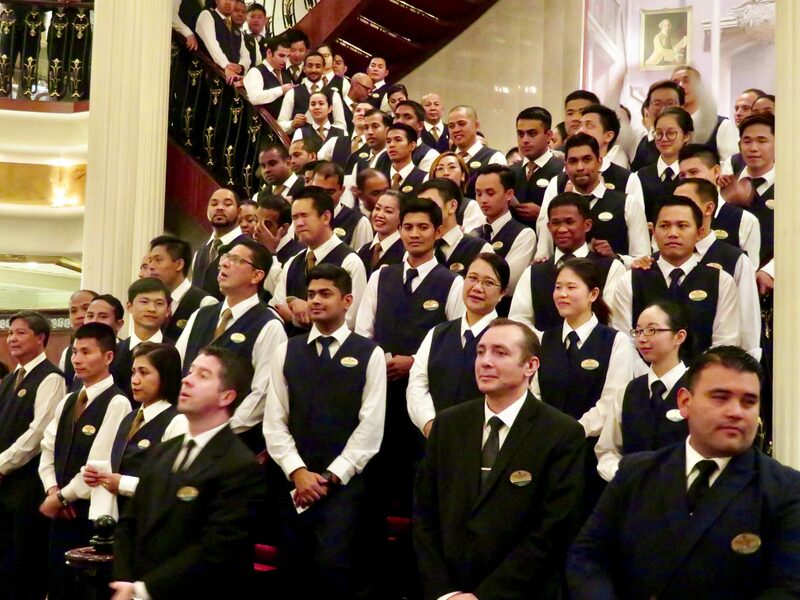 Amy Li, the Group Coordinator who only recently joined Mariner of the Seas, has the role of managing the events for large and small groups, including functions, shore-side excursions, celebrations and bookings. The fabulous Duo Bolshakov kept us entertained with their death defying aerial stunts. Amy has coordinated many gay group bookings for Royal Caribbean and confidently assured us everyone is welcomed and well looked after. Over the course of our cruise, the LGBTQ meet-ups at Boleros Bar attracted over 20 guys who met most nights for a few pre-dinner drinks and laughs as well as to plan and share the rest of the evening. On the second last night we all dined together at several large tables to swap stories about the good times we had on our voyage. Amy also joined us and made sure that everyone was comfortable and enjoying themselves. 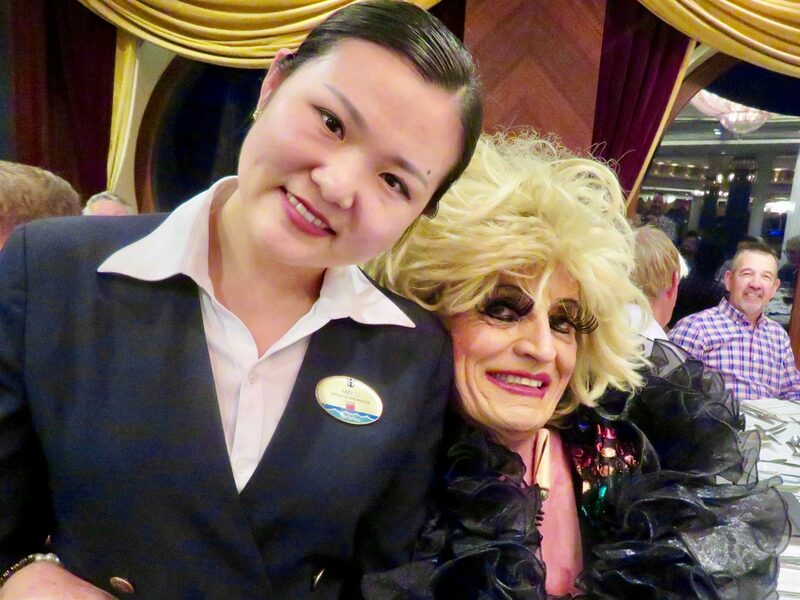 We met a wonderful group of new mates on board The Mariner Of The Seas. It’s been our experience the number of gay cruisers on board a ship can sometimes depend on the country of embarkation and the destinations offered. Whatever the itinerary includes, cruising with Royal Caribbean offers gay travellers the chance to easily meet fellow rainbow seafarers in a safe, relaxing and hassle free way, to see fascinating places and share unique and sometimes unexpected travel opportunities. Check out the popular and exciting Meet Me Onboard Gay Cruise Calendar.